Top Contractor Mortgages have changed the market for contractors. In the old days, if contractors wanted a mortgage, they went to a high street bank or building society. When they got there they were told that they needed to produce three years worth of accounts. They were also told that the loan amount offered would be based on a multiple of the contractor’s director’s salary. That’s exactly what happened to me when I became a contractor many years ago. I had to forget it for a few years. When I say that this is the way that it used to be, it is still that way at the high street banks and building societies. They will still tell you the same things today. 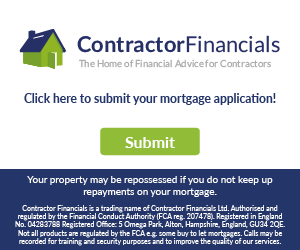 What has changed is the advent of specialist contractor mortages and specialist contractor mortgage brokers like Tony Harris. Tony created the specialist contractor mortgages market. He got the big lenders to understand that contractors and freelancers could afford more than a mortgage based on their director’s salary. He also Made them see that contractors should get offers based on their daily rate. This is at multiples of up to 4. Take a contractor getting £500 a day. That’s £2,500 a week. Multiply that by 48 for annual rate. That’s £120,000 annually. At four times annual salary the loan offer would be £480,000. They took a chance on him and neither side has looked back. He has attained many contractor mortgages in that time. ThoseÂ contractors have helped Tony’s credibility further by, in the main, keeping up their payments. There were few defaulting on their contractor mortgages. and fill in the form at the bottom of the page.